MONTEREY, CA - Corvette Racing's twin Compuware Corvette C6.Rs waged a fierce battle in the season finale of the American Le Mans Series at Mazda Raceway Laguna Seca. When the four-hour race was finished, Oliver Gavin and Olivier Beretta stood on the top step of the victory podium in the GT1 class for a record-tying ninth time in 2007. The "two Ollies" drove their No. 4 Compuware Corvette C6.R to a 30-second victory over the No. 3 Compuware Corvette C6.R of Johnny O'Connell and Jan Magnussen. The pair completed 150 laps of the 2.238-mile road course and finished 11th overall to crown their third championship season together. 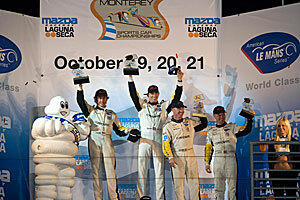 Beretta extended his record for career ALMS victories with his 37th win, while Gavin notched his 28th career ALMS title. 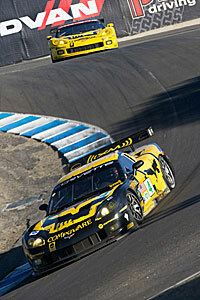 Corvette Racing won the GT1 manufacturer and team championships for the seventh consecutive year. "I have to take my hat off to Olivier because he drove brilliantly," said Gavin. "We were knocked off the track twice today, and there was big pressure all the time from our sister car. The one thing that kept us in front was the pit stops. The guys did a fantastic job with every stop, and our engineer Steve Cole and Corvette Racing gave us a mighty car. This was the best car we've had at Laguna Seca, and a victory was a fitting way to finish the season." The lead in the GT1 division changed hands three times in the four-hour race. Magnussen started on the pole and led until the first round of pit stops at 56 minutes into the race. Gavin took the lead over O'Connell at the first driver change, but surrendered the point after contact with a GT2 Ferrari in the Andretti Hairpin shortly after two hours of racing. The No. 4 car regained the lead on the second round of pit stops and driver changes at the 2:16 mark. Beretta and Magnussen then drove the last hour and 45 minutes, stopping for a splash of fuel and tires at 20 minutes before the checkered flag. "I have no words to describe what the Corvette Racing crew can do," said Beretta. "I had contact, Ollie had contact, and on the pit stops they gave us more than 100 percent and put us in front. They are awesome." The GT1 race was literally won in the pits. "We were a little down after finishing second in the pit stop competition, but we pulled together," said Ray Gongla, crew chief for the No. 4 Corvette. "The guys had to do three flawless pit stops in a row, and they did it." Magnussen mounted a furious charge from lap 99 to lap 109, cutting Beretta's lead to 1.74 seconds at one point. "We had a really good car in the beginning of the race, but when I got in the car on a different tire compound, it was a little hard for me to find a good balance," Magnussen reported. "The first few laps in my second stint were very fast and I was starting to regain the lead, but after about eight laps the other car was just as fast so I couldn't catch Olivier. "It's been a great season with Corvette Racing," said Magnussen after his first full year with the team. "To be with this team and to see all of the Corvette fans, I feel like it's the best time of my life right now. I hope somebody comes out and races with us next year to make it even better." Corvette Racing program manager Doug Fehan reflected on today's result: "I think the final race of the season was the crowning touch to what we did all year - perfect races, no mistakes, and dedicating ourselves to getting better every time. It's a great ending to a great season." The Monterey Sports Car Championships marked the conclusion of Laguna Seca's 50th anniversary celebration and a milestone for Corvette Racing. "Fifty years ago, Zora Arkus-Duntov, the godfather of Corvette Racing, conceived the Corvette SS race car to put Corvette squarely in the arena of international endurance racing," said Chevrolet general manager Ed Peper. "This year marks the 50th anniversary of both the Corvette SS and of the Laguna Seca circuit. As we look back on the results today at this great track and reflect on Corvette Racing's record of success over the years, it's clear that the Corvette C6.R has realized Zora's dream." "Corvette Racing has again set the standard for engineering excellence, preparation, and commitment in the American Le Mans Series," Peper noted. "The team came to race at every event, and ran with all of the passion and skill that have made Corvette Racing America's premier production sports car racing team. The drivers, mechanics, engineers, support personnel and team managers of Corvette Racing have made everyone at Chevrolet proud, and I congratulate every one of them on a job well done."